At the Wake Forest Farmers’ Market today, purple-hull peas made an appearance. There were lots of questions about them. What are they? They certainly don’t look like what most folks are used to as “peas”. How do you cook them? Do you eat the pods? What do they taste like? One of the joys…or perhaps frustrations, for some…of a trip to the farmers’ market is that you find “new” vegetables–uncommon ones, or simply regional ones–like purple-hull peas which are not necessarily included in a vegetarian cookbook. So you need general, basic information–not fancy recipes; just the basics for starters. Where to go? There are lots of vegetarian cookbooks out there–some very sophisticated with wonderful recipes that make vegetables into worthy main courses or entrées; however, that’s not what you need to begin cooking a vegetable that is completely new to you. For that what you want is the nitty-gritty information of how to prepare it–do you shell it, peel it–or how best to cook it. The more sophisticated vegetarian books may just call for the ingredient and not give you the those basics or even just some simple recipes. 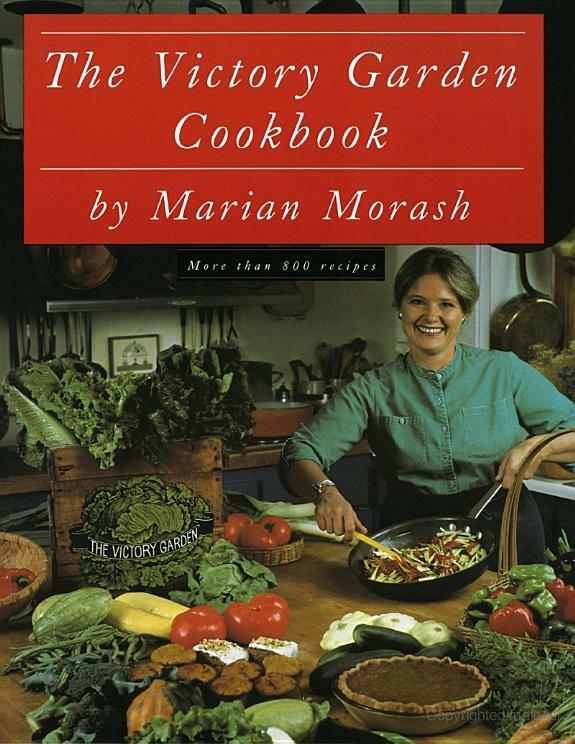 One of my favorite vegetable (note that I didn’t say vegetarian) cookbooks (and gardening information too) is The Victory Garden Cookbook by Marian Morash. It’s organized by veggies in alphabetical order so you can go directly to beets, kohlrabi, cauliflower or whatever, and find information on growing, preparing, buying the vegetable. There’s a highlighted section of special information that includes yields (how much usable vegetable do you have after preparation/trimming or peeling), how to store and preserve, microwave instructions, and even suggestions for things to do with what is left from your first use (especially useful if you’re doing single-serving cooking). Now that’s a vegetable cookbook! The recipes given go from the most basic to more advanced. Terms (e.g. string and snap beans) are explained. It’s a great place to start with a new vegetable. The one I have in my library was published in 1982– I guess it’s time for me to go to the Regulator Bookshop and browse through the cookbooks again to see if there’s a new edition and if it has significant additions. As for pink-eyed purple-hull peas…well, unfortunately, the closest this book came was black-eyed peas. True, they’re a Southern thing…and that’s another post coming up. It’s the Word Press–free one! Hi, Anne! I’ve never heard of purple-hulled peas. They aren’t specifically described in my veggie reference (see below) but it has a picture of peas that certainly have purple hulls. Your readers might be interested in the book: Edible: An Illustrated Guide to the World’s Food Plants. Published in 2008 by National Geographic. Not a cookbook; it gives historical origins, botanical facts, and culinary uses for just about everything. Thank you so much for that reference–it sounds like a wonderful source. Purple-hull peas are definitely a Southern thing! I’ve been surfing the ‘net trying to find out more about them. I do appreciate you sharing that reference–seems like a must-have for someone selling veggies!